On arrival, you’ll be escorted to the 5-star Arakur Resort & Spa where sea-view rooms have been reserved for General Tours guests. The South Shetlands are a haven for wildlife, home to vast penguin rookeries, beaches ruled by Antarctic fur seals and large colonies of Southern Elephant seals. Along the Antarctic Peninsula, you’ll have time to explore a pristine wilderness of snow, ice, mountains and waterways. Apart from penguins and seabirds, you are also likely to see Weddell, crab-eater and leopard seals as well as Minke, orca and humpback whales at close range. Long ago, a tremendous volcanic eruption caused the islands peak to explode and seawater flooded into the resulting caldera, creating the unique landmass General Tours may visit today. With the right conditions, General Tours Captain will be able to pilot the MV Ushuaia through a narrow gateway in the icy cliffs of the island and take General Tours ship into the caldera itself! This crescent-shaped island offers excellent hiking opportunities and some truly glorious scenery. A short uphill climb over the cobbled beach brings you to a colony of breeding Chinstrap penguins. This spectacular rust-colored promontory on the Antarctic Peninsula is home to 20,000 Adélie penguins and a smaller group of Gentoo penguins. There is also a large number of Kelp gulls, Snow petrels and Pintado petrels in the skies above. 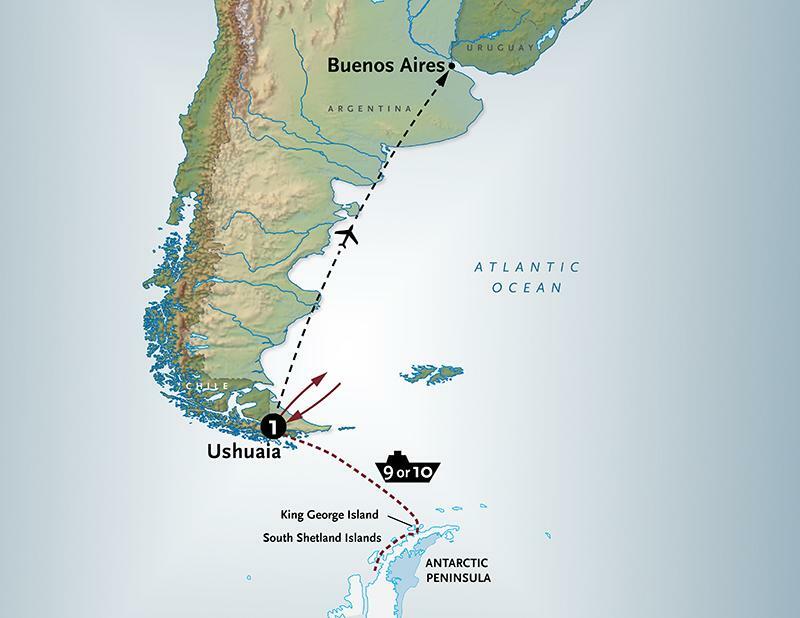 Another opportunity to actually step onto the Antarctic continent would be a visit to the Argentine Antarctic Station of Esperanza. This is a year-round station along the Antarctic Sound complete with a small school, as some of the personnel come here with their families. This small group of islets in the Palmer Archipelago is home to Chinstrap penguins, Blue-eyed shags and Kelp gulls. An ascent to the island’s summit is rewarded with spectacular views of the Gerlache Strait and steep ice-covered mountains. This gateway for a route to the Peninsula Plateau is distinguished by a steep snow slope that rises from the rocky shore toward the Plateau. There are large glacial tongues, high ice cliffs and a bay that is often iceberg-filled.